SAVE $ and BUY FROM our WEBSITE - FREE SHIPPING to USA & Canada on ALL DECAL ORDERS over $10! You will get 1 Pair of Lightning Bolt decals & 2 (1 Pair) Elina ‘rub-on’ decals. SKU: TEC01. Categories: Elina, Various Small Decals (All). Tags: BMX Saddle, BMX Seat, Elina, Elina Aero Turbo, Lightning Bolt, Old School Vintage BMX, Tahei Elina. 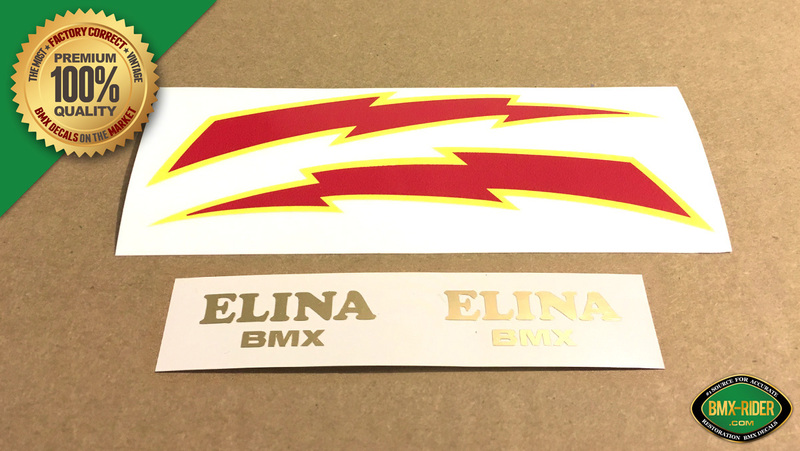 This is a NEW Factory Correct “Elina BMX” & Elina LIGHTNING BOLT Seat Decal Sticker Set for Tahei Elina “Lightning Bolt” saddles. These replace the original faded silkscreen ‘Lightning Bolts’ and the gold ‘Elina BMX’ decals on the sides of the seat (to replace the original gold heat stamping). These were found on the Kuwahara KZ-1s, KE-1s (1979), and was used on other 80s bikes like Redline, Hutch, PK Ripper and more. These decals have been digitally printed and are of high standards. Size and colors are very accurate to original factory specifications. The gold “Elina” decals are to replace the original heat stamps. © BMX-Rider.com | Factory Correct Decal Pros | All Rights Reserved.